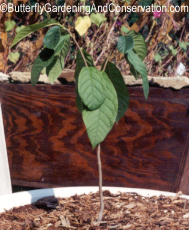 Pawpaw is a multi-stemmed small tree or shrub with a sort of semi-tropical look to it. Should be planted outside of direct sunlight for first year or two. It blooms in the spring and has bright purple, 3 lobed flowers. The fruit PawPaw grows to 2-5 inches long, is edible and a great source of vitamins A and C. Two trees are necessary to produce fruit. Pawpaw is native to much of the eastern US. Zebra Swallowtails use PawPaw and only PawPaw as a host plant. If you can't fing a local place selling pawpaws, you might want to try Nature Hills Nursery. You can read more information about PawPaw at the Nature Hills Nursery site to either order, read more detailed information about about PawPaws or see more detailed pricing information. Or order by calling 1-888-864-7663 using the Source ID: 86642! You can also sign up to have a seed and plant catalog from Nature Hills Nursery mailed to your home to order next spring also. This family consists of small and medium sized trees, mostly in tropical regions.